Every day, Americans make decisions about their privacy: what to share and when, how much to expose and to whom. Securing the boundary between one’s private affairs and public identity has become a central task of citizenship. How did privacy come to loom so large in American life? Sarah Igo tracks this elusive social value across the twentieth century, as individuals questioned how they would, and should, be known by their own society. 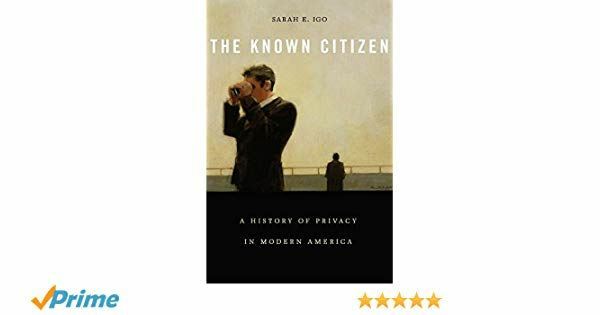 Sarah Igo, author of The Known Citizen reveals how privacy became the indispensable language for monitoring the ever-shifting line between our personal and social selves. Igo’s sweeping history, from the era of “instantaneous photography” to the age of big data, uncovers the surprising ways that debates over what should be kept out of the public eye have shaped U.S. politics and society. It offers the first wide-angle view of privacy as it has been lived and imagined by modern Americans.